A long long time ago a young boy was born in a fishing village and nobody knows quite sure why this young boy was unwanted in the village, so the village people through him in the sea and this little boy was swallowed by a huge whale and the whale takes him down down down to the bottom of the sea. at the bottom of the sea is a secret cave and in this cave the teachings of yoga are being song every single day. It is the cave of Shiva and Shakti and the teachings go something like this: Shakti will come to Shiva and say "Shiva what is the secret of the universe?" and Shiva looks at his beloved and says "Shakti you are the secret of the universe, you are the point the universe was trying to make" and their conversations turn into love songs. And sometimes Shiva will come to Shakti and ask "What is my nature" and Shakti will look at him and say "your nature is vasudava you are the dwelling place of light itself. deva is light and vastu the dwelling place". During this time the little boy is in the belly of the whale and he keeps asking the whale to keep him close to this cave I want to hear these teachings. For 12-16 years the boy stays close to Shiva and Shakti by that sacred cave learning the teaching of yoga. The boy overhears Shiva and receives a transmission of the teaching, and in this way becomes a student of yoga. For the next 12-16 years, Matsyendra lives in the belly of the fish, practicing yoga, and finally emerges as an enlightened master. 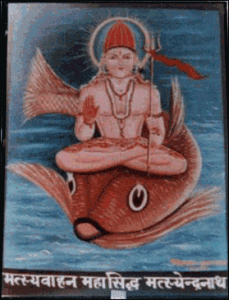 Then one day the whale raises up to the surface of the water and spit this now 16 year old boy and he is half man and half fish (hence ardha= half matsyendrasna= fish the common yoga pose) and he is now Matsyendra the lord of the fish and he is a great great great teacher of yoga. Seven years prior to this there was a women doing all these practices trying to get Shiva's attention because she wanted a son. So Shiva came to her and he walked by her in his beggers form and he put a pile of ash into her hands and he said take care of this pile of ash and it will become your son. She was so insulted by this she throw the pile of ash into a big pile of cow dung. Seven years later Matsyendra goes to the women and says "Where is your son, because he is going to be a great teacher of yoga". She looks at him and says "what son, I have no son". He said "yes the pile of ash you were given". She was shocked he knew that and said " I was given no son I was just given a pile of ash which I throw on top of cow dung because that's where it deserved to go". Matsyendra just smiled and said "can you tell me where that pile of cow dung may be?". Matsyendra finds this pile of cow dung and brushes away the accumulated cow dung and there is a young boy, who is a perfect yogi because he has been practicing sadhana there since birth. 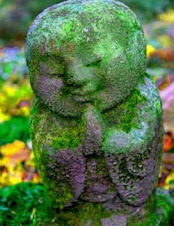 Matsyendra sprinkles him with ash and names him Goraksha (Go-rakh or “cow ash.”) This little boy name Goraksha becomes Matsyendra's first student and also becomes the founder of modern day hatha yoga. Matsyendra. I took a class from Tiffany Wood this evening which was part of the Anusara Immersion she is leading out of The Yoga Center. She told this story and she talked about how the things we throw away can be our biggest blessing. Tiffany said at the end of class that it is embracing our biggest challenges that lead to the biggest change rather then throwing away are challenges and/or trying to avoid them. She lead a class with lots of twisting and deep forward. I feel so fortunate to be surrendered by such wonderful studios + knowledgeable teachers and that the teachings of yoga are available to me. I was talking to a friend and fellow teacher and she was asking me how I do my class planning and asked if I would share my thought on this blog. Before teaching a class I like to know what main alignment principle or secondary alignment principle is that I am going to be focusing on, a heart quality to theme off of and an apex pose to work toward. I come up with these in different orders. Sometimes I know the heart quality I want to use, then I think about a universal principle of alignment that links well to the heart quality and then think of a peak pose that would let the students really work and connect with the upa and the heart feeling during. Or I will know what apex pose I want to use, then I look at the structure of the pose and see what upa works well with it, and then connect a heart quality with it. Or I know what upa I want to focus on, and link it with a heart quality and a apex pose. After I have those three main elements of the class I will also write down some other poses that will sequentially lead toward the apex pose while helping the students figure out the actions of the principle of emphasis as well as feel the heart quality in the poses. I will also write down some poses to help ground and relax them before shavasana or seated meditation (things like twisting, rooting the thigh bones, pranayama). With all the planning I do I go into the class knowing that what I planned might not be appropriate and I might have to ditch aspects of the plan or the whole plan. Ultimately I want to serve the students as much as I can so if what I had planned doesn't ultimately serve all the students I will figure something else out. I also want to mention how much I managed to stress myself out in my early days of teaching with trying to come up with the perfect class plan, and every once and a while now i will experience anxiety as I come up with a plan. When I see this happening I try to remind myself that the reason I am planning is to be prepared it is NOT to create more stress in my head so I try hard to soften and stay grounded. I am a much better teacher when I am not worrying about my class plan. I hope this was interesting or helpful for you. Happy class planning or class practicing to you. Last week I was themeing on how facing challenges on and off the mat is one of the quickest ways to grow a habbit stronger. I talked about how if you can apply the universal principles of alignment (UPA) in a challenging pose you will get stronger at being able to apply those principles, so when you are in a pose that is less challenging you will be even stronger at using the UPA's. However, if when facing a challenge you use unhealthy habits or on the mat if you lose your alignment you will be instead strengthening the misalignment's making the misalignment's more prevalent in other poses and in your posture off the yoga mat. After themeing on challenges this week I have been faced withe a challenge oppurtunity to grow. This week I started teaching at a new location, a gym (Steiner Aquatic Center). I haven't taught at a gym in about 4 years and when teaching at any new place I get nervous. My brain tries to tell me "I'm not good enough" "the students wont like me"... So showing up and practicing my confidence and believing that I am good enough, that I know my stuff, and that I have something to offer is hard for me. But I know facing this fear but still cultivating confidence will help me be more confident in all areas of my life and make me a better teacher. But just like the example above, I also know that if I listen to the negative self talk in my head and when facing this challenge I tell myself "I am a piece of crap and am no good", I will be strengthening that negative self talk, which would show up in other areas of my life, making me feel miserable! 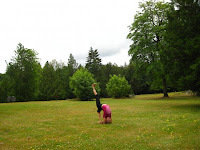 One of the gifts of teaching yoga is I get to share really awesome wisdom for facing the ups, downs and oppurtunities in life, and then when life's ups, downs and opportunities appear in my life I get to choice if I am going to walk my talk or if I am going to not take the advise I teach in class. And boy does it feel good when I am walking the talk. My husband and I bought our first home, which is definitely a fixer upper, four months ago. Saturday is a house improvement day for me. So today I focused on the dinning room: sanding, patching, painting. It is very fun to watch the change that happens to the house as we both slowly but steadily chip away at home improvement projects. Its really reminds me that CHANGE IS POSSIBLE. One of the comments I hear most frequently in response to me teaching or practicing yoga is "I cant do yoga, I am not flexible enough." This always makes me smile. In my head (and sometimes out loud) I think, well duh! Flexibility is NOT a requirement of yoga instead it is one of the side effects of yoga, so if you haven't been practicing yoga chances are you are not going to be flexible. My point is one does not need to be flexible in order to practice yoga. I was not flexible when I first started practicing and the majority of students arnt flexible when they start practicing. But the cool thing is that having a consistent practice + good alingment = flexibitlity will come. So if you or someone you know has been using the line "I'm not flexible enough to practice yoga" come give it a try.